For those who did poorly on the Wooden quiz, or for those who missed some points on their mobility or technique presentations (perhaps because you had to postpone it on your assigned day because you were not prepared), there will be a few ways to gain points back. The first, and perhaps the best way (the others will most likely be more tedious and more boring), will be to go to the “Tough on Top” clinic on Saturday Nov 12. 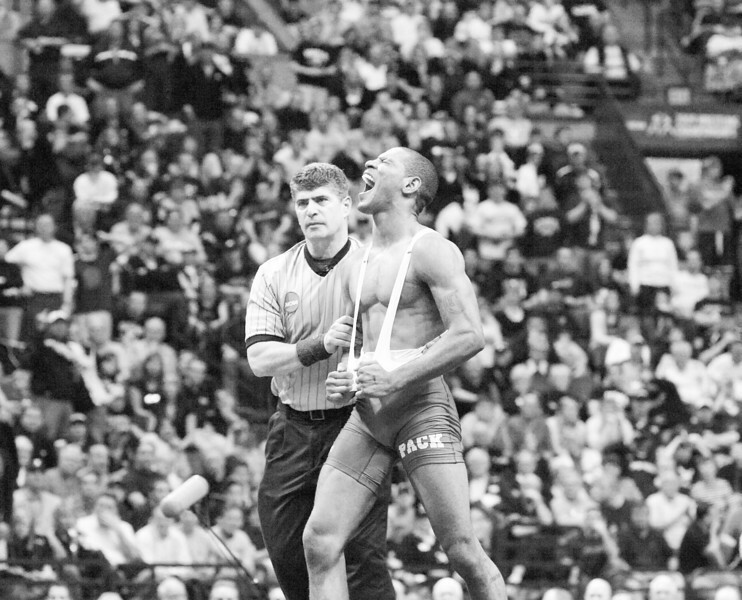 That clinic will cover breakdowns and pinning holds from the top position, and will feature Darrion Caldwell, 2009 NCAA DI champion and NCAA tournament outstanding wrestler. This is the guy who whooped Iowa’s returning champ Brent Metcalf, so he’s legit. This is a great opportunity to learn from the best. The clinic costs only $40, and will be held at Santiago H.S in Corona. Registration begins at 7am, clinic starts at 9. If you go to this clinic and bring back proof, it will make up some, perhaps all, of the points you are missing (depending on how poorly you’ve done so far). Most of you guys are getting 100%s anyway, and that does not mean you cannot or should not go to the clinic anyway. Yes….to master Kung Fu, the training must be severe….and this really ain’t severe. Step it up, guys. Nothin strenuous here fellas. 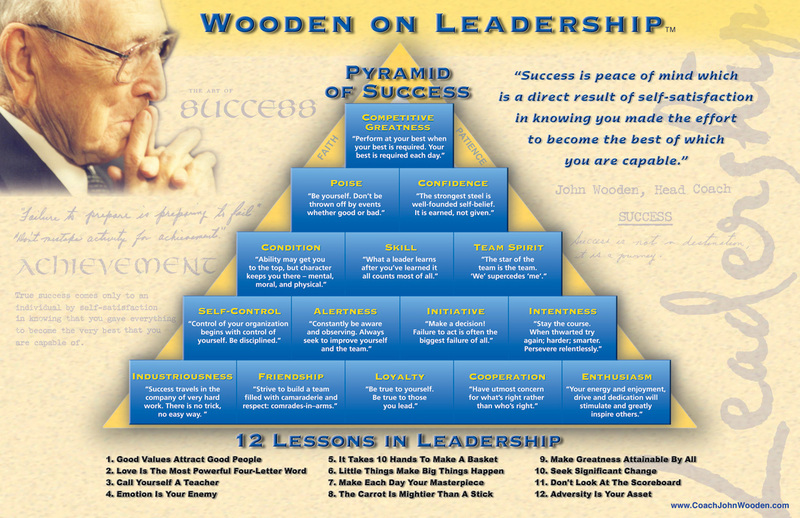 There will be a quiz on the John Wooden Pyramid of Success (below) on Oct 31. You have a little under a month to study for it. Easy as pie…memorize the 12 lessons on leadership below the pyramid, then memorize one block per level (and the explanation of it). Lastly, be able to write a paragraph (7-12 sentences) on some of those you memorized, explaining why they are relevant, on and off the mat. You do that, you pass with flying colors. You do that without being cliche and cheezy, and you show some depth, and you are a John Wooden Jedi. Let’s not make this a stresser. I know some of you are applying to colleges, wrestling with the SAT, etc, so don’t freak out. The key here is redeeming time that you already have but you waste. So, for example, some of you get to school 20 minutes early, and you sit down in a corner and listen to your headphones. Why not take just FIVE of those minutes per day and study the pyramid? Or, stop shufflin your feet in the hallway, get to class one minute earlier, and use that time to study the pyramid? Rather than trolling on Facebook at night (which I KNOW most of you do), take FIVE of those minutes and look over the pyramid? See? Easy. Five minutes a day. A few things. As I hope you can already see, I want you to learn how to manage your time. There are several pockets of wasted time you guys have per day…use it to shape your destiny in a positive way, instead of zoning out. Secondly and similarly, there are a thousand and one intangibles that make a champion on and off the mat. These things are usually caught than taught, but there will be no “caught” without some sort of “taught.” Your parents are teaching you these lessons at home, and a little reinforcement is always good. Remember: technique is important, but the difference between you being a CIF champ one day and you not even making it out of league won’t boil down to how well you can execute a single leg, but will boil down to all those intangibles that you’ve had drilled into your being day after day. You say you know what it takes to be a champion. Well, DO YOU? If yes, then you’ll see the relevance of what you are being asked to do. Wooden, though he was a basketball coach (we can forgive him), was a genius. Read his books….all of them. Sit at his feet and learn. Yes…because you must be a student of the sport. You must take responsibility for keeping yourself healthy and mobile. Technique and tenacity aren’t the only things that will make you a champion. Keeping yourself healthy and injury free (read: injury prevention) is a big part of the equation. That is the name of the game for this homework assignment. Knowledge is power, or something like that. So here’s the deal: nothing big. Some of you are already doing this. You need to go to the Mobility WOD website and learn a few stretches/mobility workouts (none are longer than 10 minutes, and all are on video). Every day (or almost every day) I’ll draw a few names, and whomever is drawn must demonstrate a stretch or mobility workout to the team. It must be something from that website, something we don’t normally do, and something other than every day stretches (ie, touching toes, etc). You simply must demonstrate that you’ve been on the website and learning. I will not require you to have comprehensive knowledge. One other thing: learn more than one stretch, in case someone drawn before you takes your first stretch. If you show that you have not been watching the videos and have not done your homework (ie, you wing it), you will get a zero for this assignment and this will affect your grade.